Resolution 2016-44 was enacted in order to ensure access by emergency response vehicles in the event of a life threatening emergency on one of our Township roads. These regulations have been adopted to preserve the safety of residents and others traveling on our public streets. Parking of vehicles and other items on public streets have been concerns that we have received from numerous residents. In addition, reasonable clearance and access by fire trucks and ambulances is a critical component to the response times that we provide to our residents in need. Some components of the parking restrictions will include limiting parking to the non-fire hydrant side of a street on any street that is less than 24 feet wide. For the past several decades the County’s subdivision regulations have required a width of twenty-four or more feet, so this will only apply to some of the older neighborhoods. It should be noted that a minimum width of 12 feet is necessary for a fire truck to travel safely. Additionally, parking will be prohibited on cul-de-sac portions of streets and semitrailers and moving vans will only be permitted to park on Township streets for the purposes of loading and unloading. We also are implementing an approval process that will be used for the temporary locations of portable storage units on Township streets. 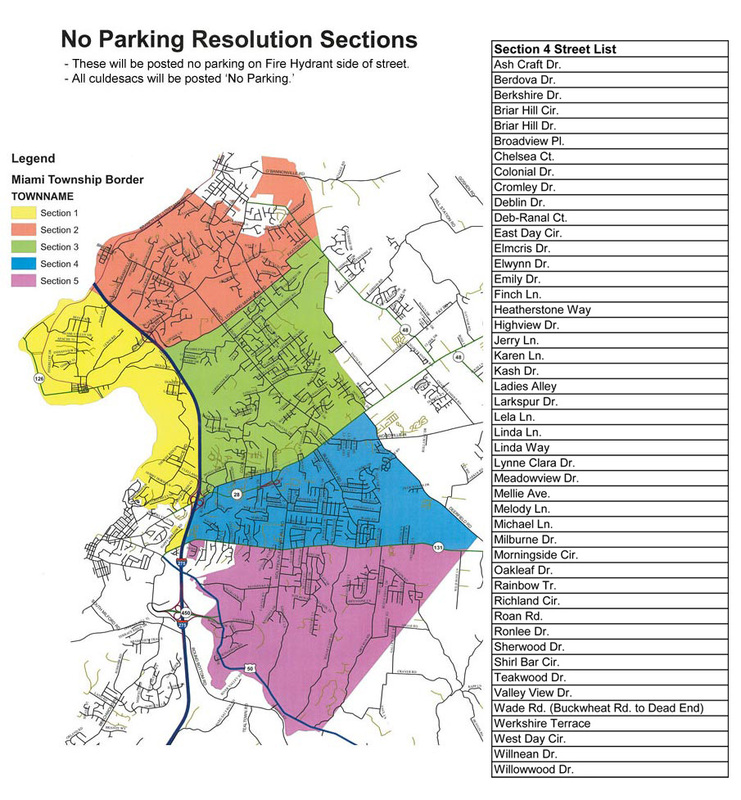 Finally, as is often requested by residents, parking will be limited to no more than 72 consecutive hours on public streets unless a specific need is required and permission is sought from the Chief of Police. We will do our best to minimize new sign posts, but they will be necessary where no other means of posting signs is present. © 2019 Miami Township OH • All Rights Reserved.